Toshiba’s Hybrid Bi-Plane System – Canon Medical Research USA, Inc. Toshiba’s Hybrid Bi-Plane System – Canon Medical Research USA, Inc. Performing pediatric cardiovascular interventions requires imaging equipment specifically designed for the setting. With superior access to both patient and equipment, Toshiba America Medical Systems, Inc.'s Infinix-i™ bi-plane cardiovascular X‑ray system will be used during two live pediatric cases at the Pediatric and Adult Interventional Cardiac Symposium (PICS-AICS), April 15–18, 2012, in Chicago. Rush University Medical Center, Chicago—Ziyad M. Hijazi, M.D., and Zahid Amin, M.D. Nationwide Children's Hospital, Columbus, Ohio—John P. Cheatham, M.D. 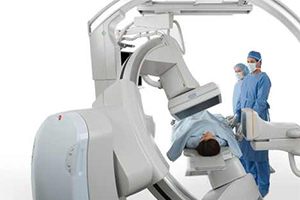 Toshiba's Infinix-i systems feature an industry-leading five-axis positioner, allowing for unrestricted patient access to facilitate advanced, complex procedures with ease. Infinix-i's design, system mechanics and tableside dose reduction features all contribute to faster exam times and safer procedures. "During pediatric interventions, the Infinix-i moves like a hovercraft, with C-arm movement that enables physicians to obtain difficult-to-reach imaging angles for more efficient diagnoses and treatment," said Stephen Bumb, director, X‑ray Vascular Business Unit, Toshiba. "The PICS-AICS live cases provide real-life clinical examples of how Toshiba's technology improves patient care in the cath lab."